The Griptilian features textured black color valox handles (which are very strong and very lightweight). Double 410 stainless liners add strength to the knife handle. The blade is BK1 black coated 154-CM stainless tanto style (plain). The pocket clip can be reversed for right or left handed people. The AXIS lock system makes the knife easy to open and easy to close (it operates identically for right and left handers). Great everyday carry knife! This size is perfect for most tasks without being so small that it is unmanageable. I wear a size large glove and my small finger just doesn't fit on it. Very easy to use with one hand because of the axis lock. The 154CM steel takes a sharp edge easily and holds it for a long time. Not quite as good as S30V but still one of my favorites. 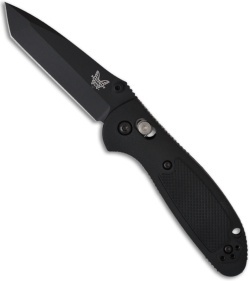 It carries in the pocket very nicely, especially with the free deep carry clip if you call or email benchmade. 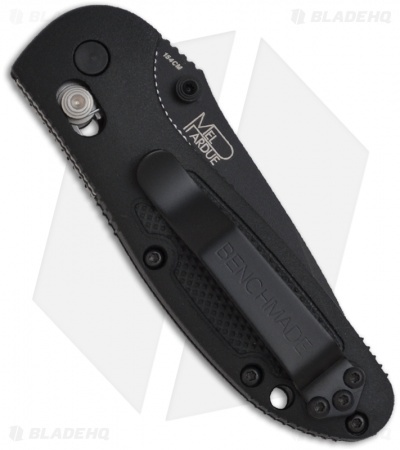 A very nice knife for pocket carry with a full (not wire-type) black clip. Being all black from the outside, it doesn't attract attention when carrying in the pocket. One-handed opening and closing works well with practice. The clip goes on either side but not the other end, so the blade is always tip-up. The handle is big enough for medium-size hands, but there's no index-finger safety area under the blade next to the handle.